This year, Liza adapted her book, Not Today, Celeste! into a puppet performance! Together with three wonderful puppeteers and an amazing songwriter/musician, Bobble Hat Theatre was formed, and with the help and support of the Charlie Waller Memorial Trust, the play hit twelve Brighton and Hove schools. The feedback was fabulous and the Bobble Hatters are currently planning their second tour. Follow the progress of this exciting project here! Liza recently took part in the Inktober challenge. See all 31 drawings on Instagram. Liza co-delivered two children’s workshops at Hove Museum this Summer – Shadow Puppets, and Glove and Hand Puppets – alongside fellow exhibitors Amanda Rosenstein Davidson and Phillip Sugg. In both workshops, children were encouraged to experiment with the materials and create their own characters, which they could then perform with in a puppet theatre. It was wonderful to see whole families joining in the fun, becoming absorbed in their creativity. If you would like instructions on how to make the Toilet Roll Puppets and the Sock Puppets shown above, please get in touch via this website or via email on minniemin@hotmail.co.uk for a PDF. More workshops coming up in 2017! Check Hove Museum’s What’s On Guide for further information. In July 2017, Liza visited the Medway Schools Emotional Wellbeing Conference, to talk about Not Today, Celeste! Teresa Day from the Charlie Waller Memorial Trust brought along the wonderful newly printed activity books to accompany the book. In April Liza delivered a workshop, with Teresa Day from the Charlie Waller Memorial Trust, to a merry band of Brighton & Hove teachers. They shared experiences and discussed the therapeutic magic of puppetry, and even made their very own sock puppet characters. The grand finale was a group puppet karaoke rendition of Endless Love! EXHIBITION AT HOVE MUSEUM and ART GALLERY! Until November 2017 you can see Liza’s work with lots of other local puppet artists in a gorgeous exhibition. Workshops and performances too! Picture Book Out June 2016! Charmingly illustrated, this heart-warming story for children aged 3+ reflects some of the feelings and experiences that a child whose parent or carer has depression may face. When it comes to periods of low mood in a parent or carer, children can often feel that they are to blame, or even that the parent doesn’t love them anymore. The story provides reassurance by explaining what depression is and how it is possible to find help. With a comprehensive guide for parents and professionals written by Dr Pooky Knightsmith that provides advice on discussing the topic with children, this is a truly valuable resource that will be of interest to social workers, child and school counsellors, psychologists, parents and foster parents. As part of a Halloween show with Bright Moon Theatre, Liza adapted, created and narrated a retelling of the folk tale Bluebeard, which featured her own puppets. 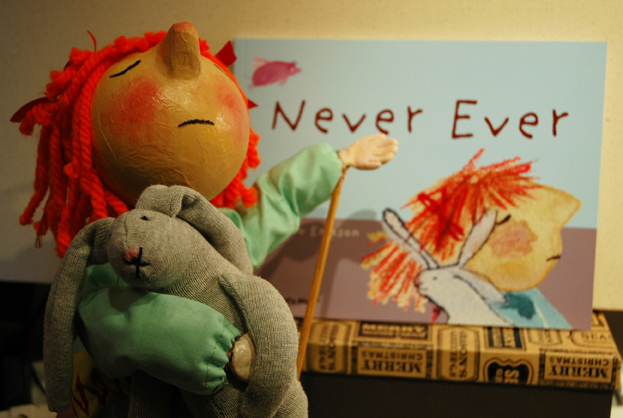 Liza’s puppets appeared at the Wychwood Festival 2014, where award-winning author Jo Empson read her latest picture book “Never Ever”.